Published 3/16/2012 . Last updated 12/17/2018 . 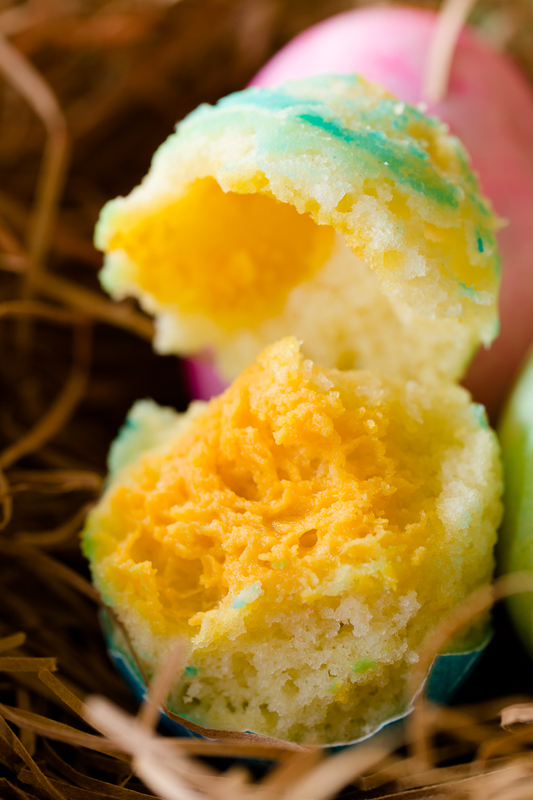 Last year, I (and many of you) discovered the magic of Easter cupcakes baked in egg shells. You can bake any cupcake recipe in cleaned out egg shells and when you are ready to eat the cake, you just crack the egg and dig in. Ah-mazing! 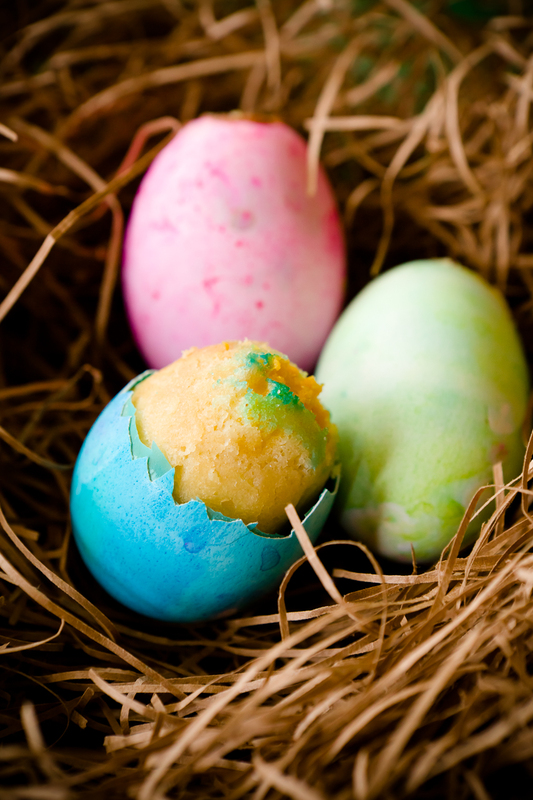 One question that I was asked repeatedly on the original Easter egg cupcake post was whether the eggs could be dyed. I decided that a visual answer was in order. As you can see, the answer is a resounding, “Yes, siree!” The dye will also get on the cupcakes themselves a little bit unless you are able to apply dye to the egg shells without getting any dye inside of the holes. 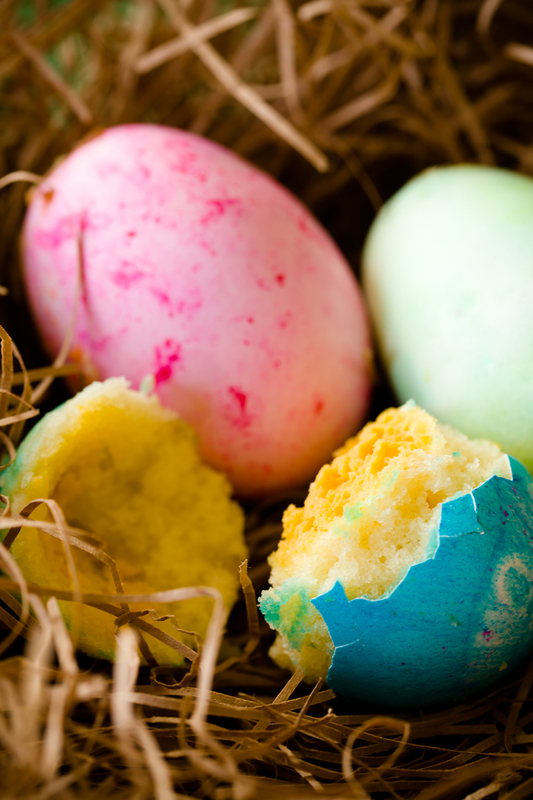 In retrospect, perhaps I could have covered the holes while I dunked the egg shells in the dye. If you give this a try, let me know. Since I was remaking the Easter egg cupcakes anyway, I thought I’d give you a little surprise. 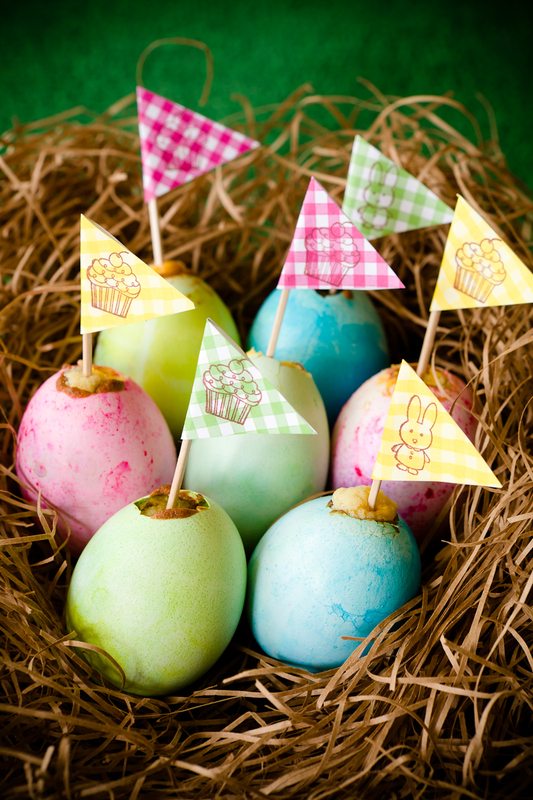 Look – this year’s cupcake eggs have yolks!! I made the yolks by piping a layer of dyed cream cheese filling between two layers of batter. It wasn’t perfect (the cream cheese part stuck to the shell a little bit and it was impossible to get the filling right in the center of the egg), but I was still egg-cited by the results. I baked the Easter egg cupcakes at my friend Brooke’s (of Sucre Shop) while listening to polka music and watching her work on her wooden spoons. Having a crafty friend definitely has its perks. Brooke came up with the idea of these adorable cupcake toppers and whipped them up – all in under fifteen minutes. She had the paper and the two stamps already in her possession. Good friends are everything that they are cracked up to be. 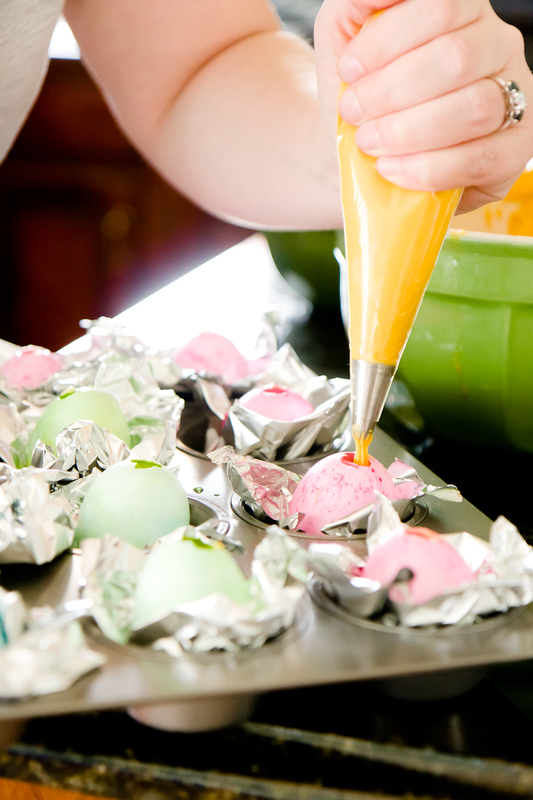 These instructions for making Easter egg cupcakes are essentially the same as last year’s instructions with the egg-ception of the dyeing step and the cream cheese “yolk” filling. 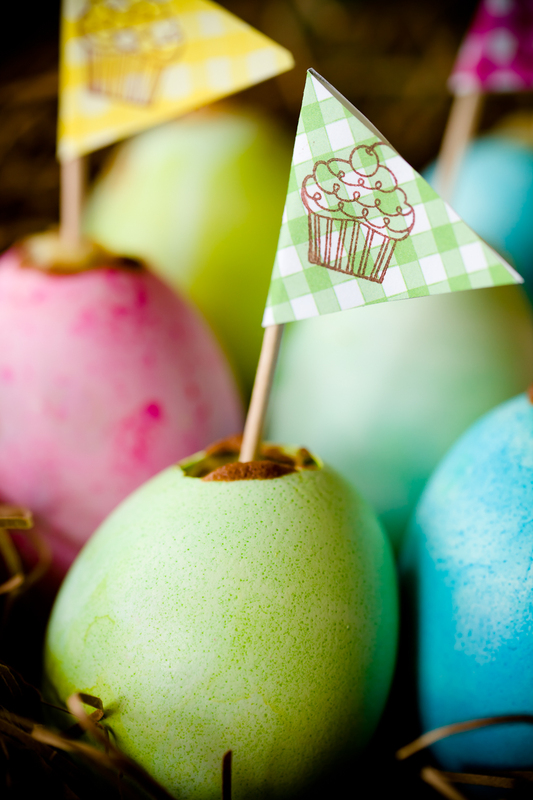 If you want the more basic Easter egg cupcake, have a look at last year’s post. 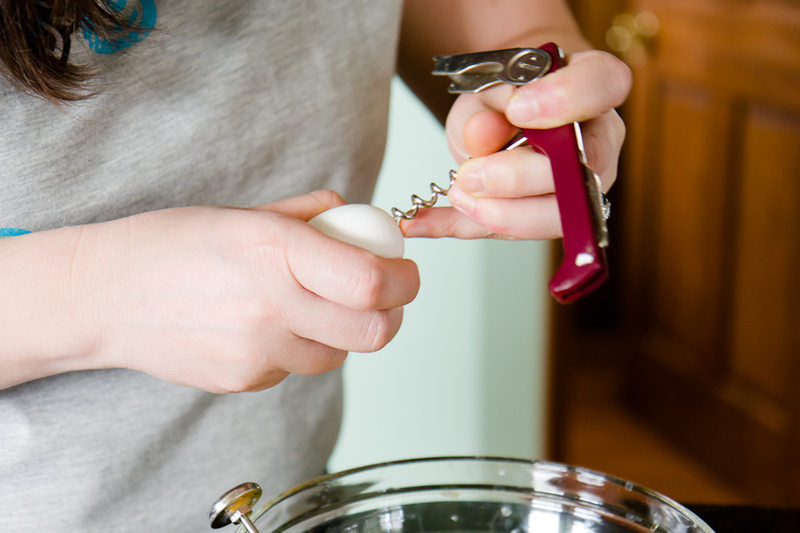 Turn each egg upside-down and dump out its contents. 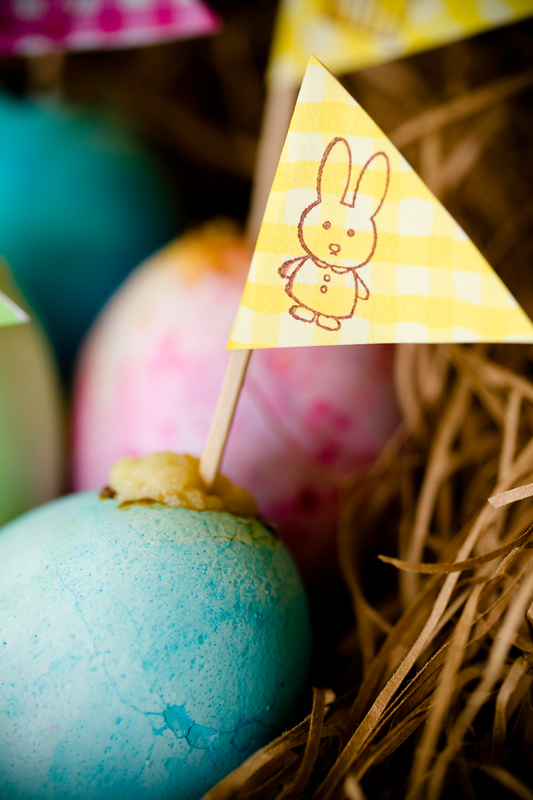 Keep the contents of two eggs separate for the cake recipe and one egg separate for the cream cheese “yolks”. If you plan on using the other eggs for baking, it might be helpful to store them in small plastic containers in groups of two (otherwise it will be hard for you to later tell how much of your big bowl is two eggs). You may wonder why there is a thermometer in the photo. I used the tip of the thermometer to help get all of the egg out of the shell. 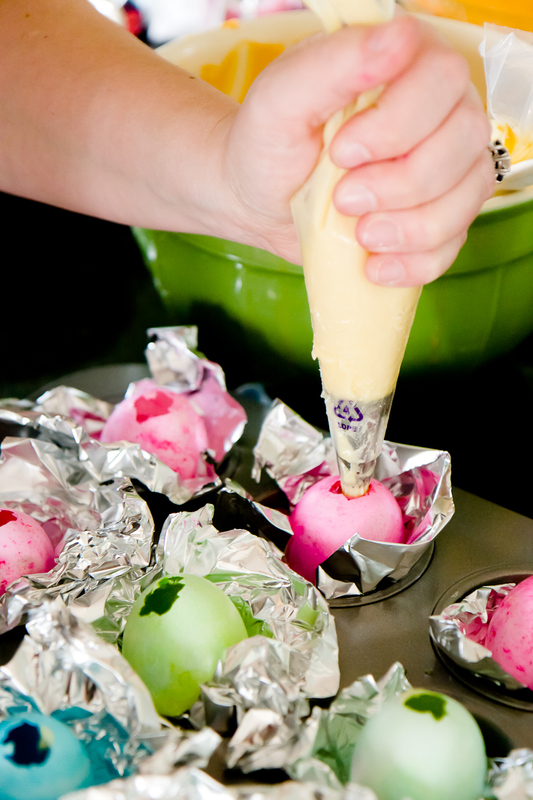 Load the cake batter and the “yolk” into piping bags fitted with small tips. Make sure that the tips can fit all of the way inside of the egg holes. If they can’t, gradually egg-spand the holes until the tips fit. 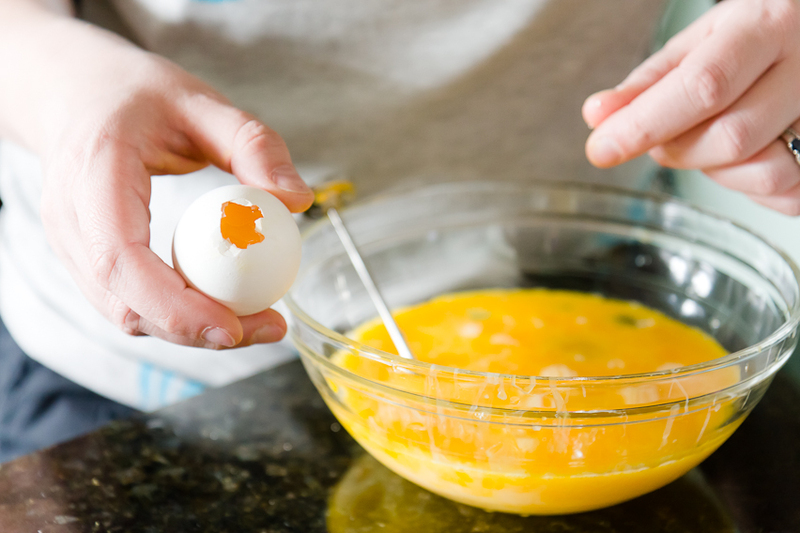 Top the batter with “yolk” until the eggs are about 1/2 full. Top the “yolk” with more batter until the eggs are about 3/4 full. This is the tricky part. 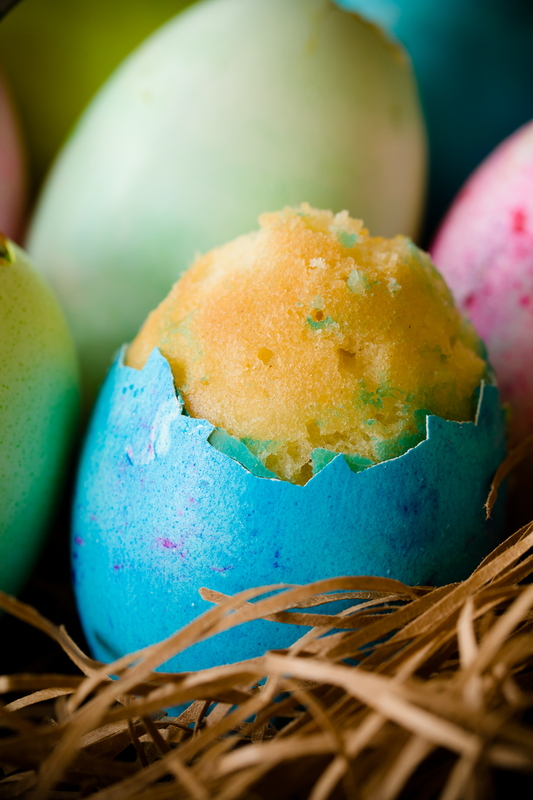 If you underfill the eggs, you won’t have complete cake eggs inside when you crack them after baking. If you overfill the eggs, cake will flow out of the eggs during baking. I found that it was best to let the cake overflow out of the top of the egg slightly and then to simply pick it off (eat it) and clean the shell with a damp towel before serving. Unfortunately, this technique may remove some of the dye. I was recently offered the opportunity to work with Frigidaire. Frigidaire asked a select group of FoodBuzz bloggers to post about our favorite springtime recipe. This is it! It’s light and lemony and full of the wonder of everything new and fresh about springtime. Read on and you just might win a new oven!